1804 Convict uprising at Castle Hill watercolour. Watercolour on Paper. The watercolour shows the 1804 convict rebellion at Castle Hill. Inscription below image reads: ‘Major Johnston with Quartermaster Laycock and twenty five privates of ye New South Wales Corps defeats two hundred and sixty six armed rebels, 5th March 1804′. Dimensions: 312mm high x 413mm long. In 1649 Oliver Cromwell led a brutal suppression of dissidents in Ireland which crystallised a strong anti-British feeling among the Irish. The resistance to British rule, coupled with centuries of conflict between Catholics and Protestants, led to outbreaks of open rebellion. The British Government wanted to avoid creating martyrs by hanging rebels in Ireland so its response was to sentence all Irish rebels to transportation to New South Wales. Most of the Irish convicts transported to Australia for sedition were sent to the Government Farm at Castle Hill, New South Wales. Here the Irish experienced harsh conditions and bitterness and unrest had been brewing. They hated the British who sent them to New South Wales, they hated the work they were forced to undertake, they hated the environment, they hated the floggings metered out by the likes of the Magistrate Rev. Samuel Marsden and they hated the way the overseers controlled by the New South Wales Corps treated them. In short they hated the British and New South Wales. The Irish, on arriving in Australia, were treated as a special class. As bearers of Jacobin contagion, as ideologically and physically dangerous traitors, they were oppressed with special vigilance and unusually hard punishments. They formed Australia’s first white minority. From the outset, the Irish in Australia saw themselves as a doubly colonised people… The New South Wales Corps junta mentality fostered two assumptions. The first was that none of them … believed that naval governors were ever on their side. The second was that the convicts were there to be used, not reformed. Both caused a rapid hardening of attitudes against convicts, the lumpenproletariat of New South Wales. The New South Wales Corps stiffly resisted any effort to criticise, or even inspect, its treatment of convicts. Trouble had been brewing with Irish convicts at Castle Hill for some time with rumour circling the colony of armed insurrection. Governor King had reinforced the guard at the Government Camp. Two hundred convicts broke out on the evening of Sunday 4th March 1804 ransacked buildings for arms before setting them ablaze to the cry of ‘Death or liberty’. Armed with swords, guns, bayonets and pikes they dragged out the Hills District flogger, Robert Duggan and flogged him. The rebellion’s leader Phillip Cunningham made plans to march on Parramatta gathering arms along the way before setting fire to the town to act as a decoy to draw the New South Wales Corp away while they hastened to the government camp at Windsor and join up with the rebels in the Hawkesbury area before marching on Sydney. A convict escaped during the riot fleeing to Parramatta to raise the alarm. With in an hour Governor King in Sydney was aware of the situation. Parramatta and Sydney were alerted to the alarm drums and gun shots as the military and militia were summoned. In Parramatta, Samuel Marsden was evacuated down the Parramatta River by boat with his and John MacArthur’s family. Marsden was an obvious target as his tyranny and brutal for floggings had created hatred among the convicts. In Sydney, Major George Johnston organised a New South Wales Corps contingent of twenty-nine soldiers and marched them through the night to Parramatta. Governor King immediately set off for Parramatta where one of his first actions was to declare martial law. The New South Wales Corps contingent and fifty members of the ‘Active Defence’ militia arrived at Parramatta at dawn. Early in the morning the troops and militia caught the rebels in a field at the present day site of Castle Hill. Major Johnstone sent the catholic priest Father Dixon, who had been transported for suspicion of having commanded a company of rebels at Tubberneering, Ireland in1798 to convince the men to surrender. After talks broke down Major Johnstone spoke to Cunningham asking what he wanted. Cunningham replied ‘Death or Liberty’ and ‘a ship to take us home’. Without further negoatiation Major Johnston ordered his men to charge and open fire. A battle followed where the soldiers and militia formed ranks and for 15 minutes carried out their duty precisely as ordered. Leaderless, caught completely unawares and totally unprepared, the rebels weakly returned the fire before fleeing in all directions. About 15 convicts were shot dead and many other wounded in the chaos. Governor King’s retribution for the rebellion was swift as he centred responsibility on the leaders who had persuaded the others to follow. King punished the leaders heavily as a public display to the rest of the convicts harbouring further intention for rebellion. There were English convicts involved along free settlers. King’s action meant that most of the rebels were let off as labour to work the government the farms in the colony was short. Phillip Cunningham was quickly hung from the staircase of the public store at Windsor on the 6th of March. The rest of the leaders were brought before a judicial panel. William Johnston who had surrendered to the authorities pleaded guilty. John Neale admitted he was in the rebel group. Jonathon Place denied all charges and the rest claimed they had been forced to participate in the rebellion. William Johnston and Samuel Humes as leaders in the rebellion were ordered hung in a public place and then for their bodies to be hung in chains. Nine of the remaining leaders were flogged with either five hundred or two hundred lashes and then sent to the new colony at Coal River near Newcastle, along with fifty other convicts implicated in the rebellion to work in the coal mines. 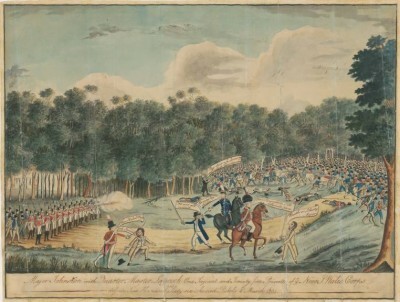 Father Dixon for his perceived part in the rebellion was made to put his hands on the raw and bloodied backs of the rebels flogged at Sydney as a macabre reminder. Others suspected of involvement in the rebellion were sent into exile at Norfolk Island to beak up the concentration of the Irish convict population in New South Wales. The Irish leaders did not see English authority as legitimate in Ireland and were not prepared to recognise it in Australia either. But for many of the convicts they just wanted a ship home, away from this harsh, hot, alien land with its odd plants and animals. Away from their convict life and Colonial tyranny. The Irish attempted many escapes with the hope of catching or stealing a ship home to Ireland. They simply could not act effectively as a collective depriving the owners of capital and land labour. The government system meant that it was difficult to withdraw labour as that would result in flogging or Norfolk Island. Like the Eureka Rebellion, or the Great Depression stand-off between the Commonwealth and Jack Lang in 1932, 1804 was the first major confrontation between labour and capital in Australia that verged on civil war. Broese, F. Island Nation: Australia’s Maritime Heritage, Sydney, 1998.